media at Surigao City Airport lounge last June 9, 2012. 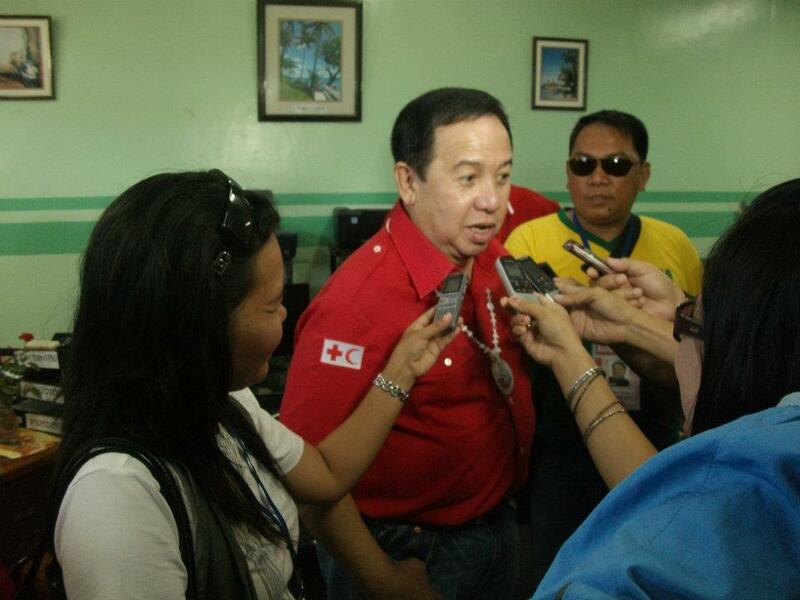 Philippine Red Cross (PRC) chairman and Chief Executive Officer Richard Gordon on Saturday led the turn-over of basic disaster response equipment and first aid kits to six barangays in Surigao del Norte. The event was held at Andres G. Acelo Gym in Claver town attended by the barangay officials of Quezon, Mansayao and Tagbuyawan of Mainit and barangays Tayaga, Magallanes and Urbiztondo of Claver as part of the Partners for Resilience (PfR) Program of Philippine Red Cross. The PRC’s Basic Disaster Response Equipment include AM/FM transistor radio, raincoats, vests, rubber boots, search light, mega phone, hand gloves, shovel, pick mattock, whistle, medical supplies and trauma jump kits. In his message during the turn-over ceremonies, Gordon emphasized the importance of having a basic disaster response equipment and first aid kits in every barangay, wherein PRC trained barangay volunteers can immediately respond during disasters.